Need a WordPress theme or Joomla template? No problem! PSD Cut-Ups can render your design in any programming language, content management system, or ecommerce platform. Simply click on your preferred software listed to the left for more information -- or if it's not there, request a custom quote here. When you have a design agency or freelance business, you don’t need to waste precious hours on programming. Choose PSD Cut-Ups and get the job done in half the time. Whether you’re looking for an alternative to overpriced programming fees or recognize the simple truth that time is money, PSD Cut-Ups can shave serious dollars from your overall costs. Your work is guaranteed to appear on the web just as you designed it, with clean, compliant code that looks good in every browser. Get your HTML site online in 5 days, guaranteed — whether the project is 1 page or 15. Need it faster? Ask about our special expedited services so you can make that impending deadline. 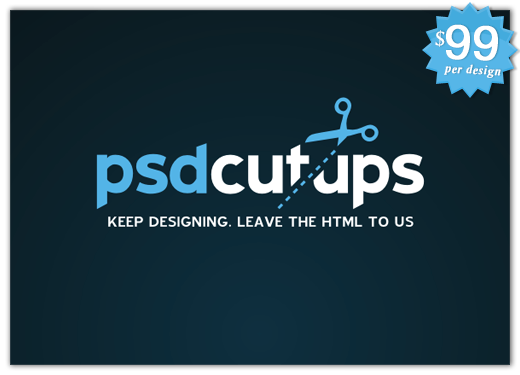 Sign up for the PSD Cut-Ups Newsletter! I would highly recommend PSD Cut-Ups. I tried a different service before and got burned, so I am incredibly happy to find someone who cares about customer service. Everything was coded so I could easily understand how things work and came with a great tutorial on how to install and maneuver the new site. Thanks guys! This was my first experience with PSD-to-HTML services, and to be honest I was looking at this as sort of a test as to whether this would be a viable way of getting my designs coded affordably but at a high level of quality. So far, it looks to be a success. Your company may be the perfect fit.